Morning, crumpets – delicious, buttered crumpets, no less. I thought I’d start my review with a piece of advice. If, like I occasionally am, you’re stuck working when Arsenal are on, and your only means of keeping up with the game is to listen to TalkSport – don’t. Whilst many of you good people enjoyed the game live, or viewed through the luxury of HD, I had to contend with Stan Collymore’s boisterous and largely moronic commentary. It’s difficult to liken it to anything. Comparing it to the wails of a distressed banshee would only be doing a disservice to that creature. I am tempted to say Collymore’s hyperbolic growls about even the slightest of events is akin to allowing an angry dog a free shot at your testicles in terms of pain, but I imagine even that would be preferable. Let’s just say that was the first time I’ve tuned into that station for longer than 5 minutes, and certainly the last. I’ll use Twitter to give me updates should a similar situation occur. At least I can turn the sound off that. Having sat down now and watched my share of the match, I can say that I’m very pleased with the result, and especially a few of our players. Olivier Giroud was excellent. He’s been unfairly maligned in certain circles – Alan Davies, WOW! – and when you consider the shoes (or clogs) he’s had to fill, it was always going to be an uphill task convincing the fans of his worth. His start may have been inauspicious, but slowly and surely he’s finding his feet. What I like most about him is his desire. You can see he wants to succeed and he wants to score goals for Arsenal. He’s strong, he’s an excellent focal point and link to our zippy midfielders, and hopefully yesterday’s excellent finish will give him a huge boost of confidence. Theo Walcott (or “Sign Da Ting” as he’s now known) also impressed in his cameo role, sparking new life into the debate surrounding him playing as a striker. His classy finish – Giroud also contributed the assist – showed that he does have the pace and finishing ability to punish defences. My only doubt is how he’ll do against a team that parks the bus. Without space in which he can use his pace, I’m not sure he’d be that affective. I could be wrong, I even hope he proves me wrong, but I just don’t see him being a success in that position. I’m sure some of you will disagree. 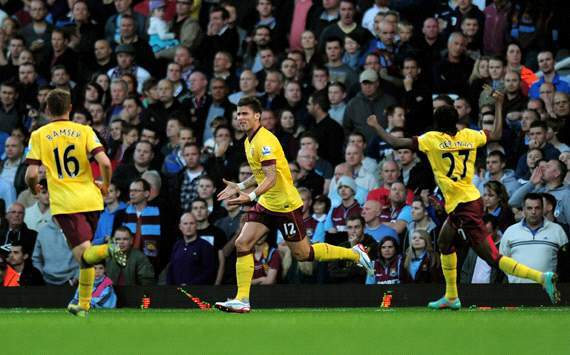 Lastly, our three points were made safe yesterday by an absolute thunderbolt from Santi Cazorla. As he has done since the first moment I saw him in an Arsenal shirt, the diminutive Spaniard impressed me immensely yesterday. Is he right footed, or left? I genuinely can’t tell – I don’t think I’ve ever seem a more two-footed player. His vision is awesome, he’s the kind of player that doesn’t go hiding, he’ll score goals, and he links the team brilliantly. And he cost us £12m. If there’s a better bit of business this season – or even the last 5 – I’m not sure I could name it. Just goes to show; when Arsene gets it right, the results are spectacular. I hope we see him in an Arsenal shirt for a long, long time. Thanks for reading today, you beautiful bastards. In the comments section, share your thoughts on the game. Are you happier with Giroud’s contribution? How highly do you rate Cazorla? Any other players catch your eye? Let me know. Lovely finish from Walcott. I was fully convinced that it was a goal right from the moment Walcott launched on to Giroud’s through ball and steered clear of the defender. He gives me more confidence when he is up against the keeper than Gervinho. I wish Wenger gives him the center spot every other game like Gervinho is been given this season. Cazorla is a genius. Podolski is an industrious player with great quality. One thing that baffles me is why doesnt our players dont take players on as much as other team players do. I’m sure given the quality of our players they will end up beating them more often there by create space for themselves rather than passing to another teammate who is again marked tight and lose ball. speaking of taking players on, i agree. it seems that the one player we have that shouldnt take players on, always does…. Ramsey..
talk sport wouid be fine if they watched any arsenal games but weve had two euro matches recently and il listened to all of keys & grey the day after each match and Arsenal hardly got a mention it was all man city so ive given up on talk sport.